Saint Peter Julian Eymard was born at La Mure, near Grenoble, France on 4 February 1811. Surrounded by the snow-capped peaks of the French Alps, the market town of La Mure had a population of around two thousand in the early nineteenth century. Most of the local people were Catholic, like the Eymard family, and many were employed in the local anthracite mines. Eymard’s father Julien was a cutler with a modest business in the town’s main street. He supplemented his income by selling oil pressed from nuts, and sometimes by quarrying and farming. His first wife Jeanne-Marie died young, as did most of their six children. In 1804 he married a second time, to Marie-Madeleine Pelorse. Peter Julian was the fourth child of this marriage and the first to survive infancy. His life has been the subject of numerous scholarly works, predominantly written by members of the two religious congregations he founded. He is still not widely known. An Australian member of the Congregation, Fr Donald Cave (1927-2006), produced more than a dozen studies of Eymard’s life and writings. Cave was wary of accounts of Eymard’s youth, which were mostly derived from the testimony of his sister Marianne (from his father’s first marriage). The future saint was also human. Eymard the devout altar boy loved to be the ‘important’ server who rang the bell. He even took the bell home at night so that he alone would be in possession before morning mass. When Napoleon’s troops marched through La Mure in 1815, he decided he wanted a ‘feather in his cap’ like Napoleon’s men, so he stole a plume from a local shop. The plume was soon secretly returned, perhaps from his own ‘weight of guilt’, as Guitton suggests, or after a rebuke from his father. Presumably, this little soldier learned right from wrong like any other child. The Australian historian Ralph Gibson has observed that during the nineteenth century French Catholicism evolved from a religion of guilt and fear to a religion of God’s mercy and love. As part of this shift, Gibson argued, there was a progressively greater emphasis on emotional experience that was reflected in the growth of Marian devotions, processions and pilgrimages, eucharistic devotions such as adoration and frequent communion, and the exquisite adornment of altars with candles, flowers and draperies. The process culminated in the spirituality of St Theresé of Liseux (the ‘Little Flower of Jesus’), whose simple religion of childlike love influenced millions of Catholics after her death in 1897. The Little Flower’s way of love found much support in places like Australia, for example, although the kind of Catholicism which had arguably taken the strongest root in Australia during the nineteenth century was predominantly an Irish form, which the historian Edmund Campion has described as essentially ‘a religion of law’. When Eymard was a boy, French Catholicism was still influenced by the Calvinistic theories of the Flemish theologian Cornelius Jansen (1585–1638). According to Jansen, people were naturally corrupt in the absence of God’s grace which was only given to those who were predestined to Heaven. His posthumous work Augustinius (1640) was banned by Pope Urban VIII in 1642. Among the legacies of Jansenism was a misguided belief that Holy Communion was a reward for the virtuous and should not be received frequently or by those who were ‘unworthy’. Thus, if frequent communion was only for the spiritual elite there could be greater merit in refusing communion than by accepting. Jansenists would abstain from receiving communion as a penance during Lent. There is no evidence that Eymard or his family subscribed to this kind of thinking, but remnants of Jansenism were sunk deep in the backwaters of French Catholicism. A current that still flowed was the movement’s emphasis on ‘piety’ or dutiful and reverential attention to religious observances. In this respect, the young Eymard was scarcely lacking in zeal. In later life as a priest, however, Eymard clearly opposed the Jansenist line by preaching that ‘You take Communion to become holy, not because you already are.’ Donald Cave observed Eymard being shaped in his youth by the religious fervour of his mother and sister Marianne. Similarly, André Guitton has noted that Eymard’s parents were ‘very good people’ who were active in eucharistic devotion. His mother regularly attended the service of adoration and exposition known as Benediction, and his father was a member of the local Confraternity of the Penitents of the Blessed Sacrament. Returning to Laus as a thirteen-year-old, Eymard again promised himself to religious life. Already, he was something of an ascetic, who could later write of the ‘joy’ of undertaking the pilgrimage ‘alone’. On this second visit to Laus, he met Fr Jean-Joseph Touche, who was a member of a small group of missionary priests in Provence led by Fr Eugène de Mazenod. The Provence missionaries had a strong commitment to frequent communion and to the poor. In the mid 1820s they became the Oblates of Mary Immaculate and later spread throughout the world, reaching Australia in 1894 when a three-man mission was established at Fremantle in Western Australia. Touche became a lifelong friend of Eymard’s. He encouraged him to study Latin and to receive communion every Sunday. Eymard’s father Julien wanted his son to take over the family business. When he opposed Eymard’s ambitions for the priesthood, the boy learned Latin in secret. When he refused to pay for his schooling at La Mure, Eymard won a scholarship. The school principal and others resented his attendance at public expense when the Eymard family was not poor. Eventually, Julien clashed with the principal and removed Eymard from the school. For a while, father and son worked together, but Eymard remained determined to become a priest. By 1827, Julien was relented enough to allow Eymard, then aged seventeen, to accept Latin instruction from a chaplain at the hospice of St Robert, near Grenoble. In return for this instruction, Eymard agreed to work as a domestic in the hospice, which specialized in venereal diseases. Unfortunately, many patients were in the final stages of syphilis and had lost their sanity. The chaplain was rarely in attendance and Eymard did not receive the Latin training he was promised. On hearing of his mother’s death, he returned lonely and isolated to La Mure in August 1828. There was no going back to St Robert’s. For the next ten months he operated his father’s walnut press and delivered oil. Still keen to become a priest, in June 1829 he moved to Marseilles to enter the novitiate of the Oblates of Mary Immaculate. Five months later, he was back at La Mure following a major breakdown in health. His vocation had to be deferred. After Julien died in March 1831, Eymard declined to take up the family business. He longed to enter the diocesan seminary at Grenoble, but his parish priest thought he was ‘lacking in spirit’. Undeterred, he set out for Grenoble. Whether by chance, design or providence, during this journey he met Eugene de Mazenod who agreed to take up his cause. After de Mazenod’s intervention, Eymard was admitted to the diocesan seminary in 1831. He arrived at the seminary as a naïve and devout young man, lacking formal education and also perhaps in wider knowledge and experience of life. According to one report, his superiors were surprised when Eymard, as a ‘tall young man of 23’, revealed his ignorance of the basic facts of human reproduction. The anecdote seems surprising when it is known that Eymard was a country boy who was raised near farms, and also because in later life, Eymard wrote of how in his youth he had battled against sexual temptations, so much so that he avoided familiarity with women during that time. But it was true that French Catholicism in the eighteenth and early nineteenth centuries was highly protective of the morals and modesty of children. Jean-Claude Colin (1790–1875), the founder of the Society of Mary, was also understood to have reached early adulthood before learning the facts of life. This reluctance to make decisions, this need to consult, to hesitate, to seek for a maximum of certitude before acting is a trait which marks the whole life of Eymard and explains many of the events which occur in later life. During his brief period at Chatte, Eymard visited the Rock of Saint-Romans. In 1712, the rock had been converted into a ‘Calvary’ with three crosses on its summit. In 1836, Eymard had a mystical experience or close awareness of God at Saint-Romans which he retained through life as a spiritual reference point. The following year, he was posted to Monteynard as parish priest. His two sisters joined him as housekeepers. Monteynard had not had a pastor since the French Revolution in the 1790s and was spiritually destitute when Eymard arrived. Although Eymard is known to have revitalized the place, he was dissatisfied with parish ministry. He began to think again about life in a religious order. After a ‘long and bitter misunderstanding’ with his sisters and reluctant approval from his bishop, Eymard entered the Society of Mary novitiate at Lyon on 20 August 1839. The Society of Mary was prominent among the large number of religious orders founded in France during the first half of the nineteenth century, when the Church was re-establishing itself after the Revolution. In 1816, Colin had originally envisaged a family of Marist missionaries and teachers comprising priests, brothers, nuns, and laity. The Holy See baulked at the prospect of such a large and potentially powerful French religious society. In 1836, permission was given to Colin to develop only a congregation of Marist Fathers. Rome gave separate approbation for other related but distinct entities, notably the Marist Brothers (founded by Marcellin Champagnat), the Marist Sisters (founded by Jeanne-Marie Chavoin), and the lay Third Order of Mary from which the Marist Missionary Sisters later emerged. 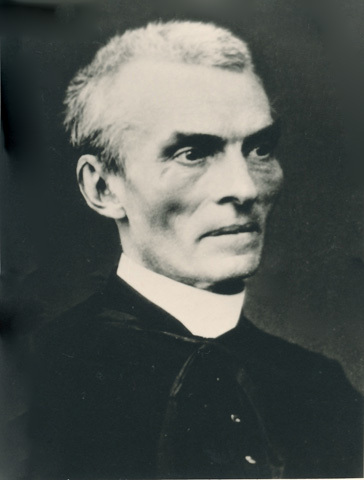 After training at the Marist College of Belley and making his profession in the Society of Mary in February 1840, Eymard began a four-year term as spiritual director at Belley. Now aged in his early thirties, he had developed maturity, experience and leadership skills. Apart from his attraction to a life of devotion to Mary, he had also become acquainted with deeper aspects of Marist spirituality, including the despising of the self and the virtues of a ‘hidden and humble life’. Eymard’s ministries at Belley included preaching, religious instruction, administration of the sacraments, and liaison with pupils and parents. He promoted an association of students called the Sodality of the Blessed Virgin, which was an elite ‘confraternity’ or brotherhood, through which he fostered reinvigoration of the college. He formed a close relationship with superior-general Colin, who joined the Sodality but refused to allow Eymard to propagate it as a special apostolate in other Marist schools. In 1844, Colin made Eymard the provincial of the Society of Mary. This effectively meant he became Colin’s first-assistant and moved to Lyon to supervise the various Marist communities in France and overseas. Among his new responsibilities, he was given charge of the Marist secular offshoot known as the Third Order of Mary, which was a lay group dedicated to Marist spirituality and to promotion of the Christian family. By 1850, the Third Order had three hundred members in Lyon, including the ‘Cure of Ars’ (St Jean-Marie Vianney) who encouraged Eymard and later recognized him as a ‘great saint’. During the mid 1840s, Eymard began to explore the writings of Marie-Eustelle Harpain (1814–1842). He identified with Harpain’s eucharistic piety and philosophy of frequent communion, later describing his introduction to her work as the beginning of a ‘grace’ or gift from God. In the capacity of visitor-general in the late 1840s, Eymard travelled throughout France to inspect the various communities. The work was stressful and he began to suffer from migraines again, but one of these visits changed his life. On a visit to Paris in January 1849, Eymard became closely acquainted with the practise of sustained eucharistic worship. He met with members of the Association of Nocturnal Adorers who had inaugurated exposition and perpetual adoration of the Blessed Sacrament at the basilica of Our Lady of Victories on 6 December 1948. Among this group of men were Raymond de Cuers and Hermann Cohen, a Jewish convert who had founded the movement after learning that Carmelite nuns regularly prayed before the Blessed Sacrament through the night. Eymard also learned of a women’s adoration society founded by Théodelinde Dubouché. He became convinced that eucharistic worship was an antidote to the ‘evil’ of the streets. ‘God is there’, he wrote. As Cave and others have argued, Eymard’s eucharistic spirituality had been evolving, but his contact with the Paris group was a catalyst that reaffirmed his ‘early attraction for Communion’ and his rejection of Jansenism’s emphasis on infrequent reception of the Sacrament. In 1850, when a group of lay people attempted to initiate eucharistic adoration in Lyon, Eymard obtained permission from the archdiocese of Lyon on their behalf. In 1851 he invited and supported the establishment in Lyon of the Third Order Reparation Sisters. This newly approved women’s religious congregation had been founded by Mother Dubouché and promoted adoration of the Blessed Sacrament as an offering or reparation for the sins of the world. After prayer and reflection at Notre-Dame de Fourvière on 21 January 1851, Eymard moved to establish of a group of men with a similar eucharistic mission within the Marist order. His experience at Fourvière, which he later called the ‘Grace of Vocation’, suggested a maturing of his awareness of the eucharist as a source of spiritual nourishment for both priests and laity. Eymard was struck by the general lack of devotion to the eucharist and the ‘sacrileges’ committed against it. To sustain, feed, perfect the Christian perfection of the laity by the adorable worship of the Eucharist. To become a victim of reparation for so much indifference, so many sacrileges . . .
That is the work par excellence . . . It is the Work for our times. Great evils require great remedies. We need Jesus Christ as both Host and Victim . . . We need for Jesus Christ to be always exposed, always a Victim, before the face of his Heavenly Father, and ever exposed to rekindle our faith, our piety and our love . . .
Eymard did not submit his plan. Relations with Colin became strained after he exceeded his authority in seeking canonical approbation for the Third Order of Mary. The application was made by Eymard in Colin’s name, but when Rome’s approval arrived in late 1850 Colin was annoyed that he had known nothing about it. The situation was exacerbated when, without Colin’s knowledge, the archbishop of Lyon gave Eymard direct responsibility for Mother Dubouché’s new religious congregation. Soon afterwards, Colin moved to clip Eymard’s wings. In September 1851, he removed Eymard from supervision of the Third Order of Mary and from his responsibilities as visitor-general. Eymard was told to leave Lyon to take up a new appointment as superior of the Marist College at La Seyne-Sur-Mer. Eymard’s years at La Seyne between 1851 and 1855 are described by Guitton as ‘a time of searching’. During this period, Eymard wrote regularly to Marguerite Guillot, a leading member of the Third Order of Mary, concerning the idea of founding a ‘Blessed Sacrament Order’. Eymard believed God had placed this idea in his heart—he later called it the ‘Grace of Donation’—but there does not appear to have been any sudden inspiration or flash of light revealing the way, merely glimpses leading to wary steps along the ‘painful path’ that Donald Cave has so carefully identified in his various studies of Eymard.